Event Promotion Plan: Brand It! I recently received a project to create an event promotion plan for an upcoming fundraising event for WHW (Women Helping Women/Men to Work). Just as you need to brand your business, it is important to brand your events with a consistent look that will get your audience’s attention and provides recognition. This may seem overwhelming to some, so I’d like to share a case study of the process for developing a plan for promoting your next event. It is painless for my clients and fun for me! 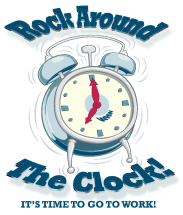 Rock Around the Clock…It’s time to get a job! Happy Days, I Got the Job! Add to that some of my own ideas — Daddy-O–Like Crazy, Man–Goodness Gracious Great Balls of Fire–Life Could be a Dream, Sha Boom Sha Boom, etc. — and you see how the process begins. 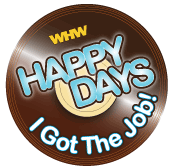 The WHW feedback was a “thumbs up” for a combination of “Happy Days – I Got the Job” and the movie marquis, “Sh-Boom-Sh-Boom.” The final result was the image displayed at the top of this article. See? Painless! Once the theme and the logo are developed, it’s just a matter PROMOTION! Visit the WHW site and you’ll see what I mean. Then come back! Come back to Designer Mouse where we can help you promote YOUR upcoming event!